After the demonstration I wanted to make some Paella myself. As I wanted it to be as authentic to La Tasca as possible, I asked if they would be able to provide a recipe for me and was delighted when the answer was YES! 1. 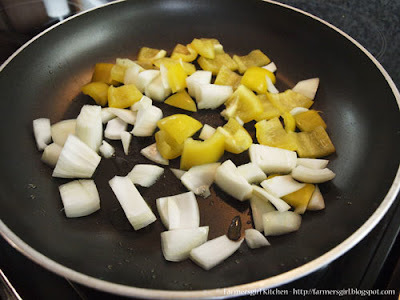 Cut the onion and pepper into roughly 2cm cubes. 2. Score a small cross on the base of each tomato, then carefully place into a pan with boiling water, leave for 20 to 30 seconds, then remove using a slotted spoon. Drop the tomatoes into a bowl of ice cold water and leave to cool. Remove the tomatoes then peel away the skin. Cut the tomatoes into quarters, remove the seeds with a spoon, and then roughly chop the flesh. Set the chopped tomato aside. 3. 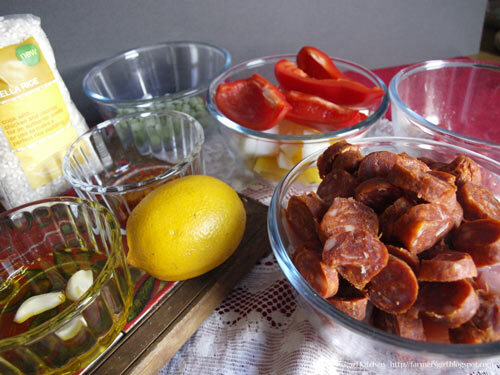 Place a Paella pan or sauté pan over medium heat and when hot pour in the garlic infused olive oil. Add the onions and peppers and cook for 3-4 minutes until softened then move to one side of the pan. 4. 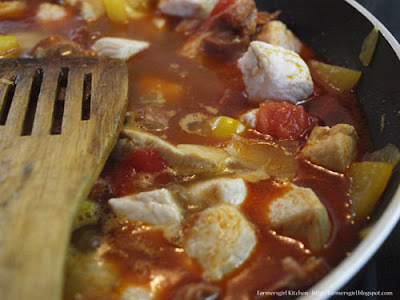 Add the chicken and chorizo, stirring through and cook for 2-3 minutes until the chicken starts to brown and the chorizo begins to lightly caramelise before mixing back through with the peppers and onion. 5. Add the diced tomatoes, almost all of the chicken stock (leave 50 to 75ml back) and the pimenton, saffron/or turmeric. Mix in the green beans and peas, turn the heat up and once the broth is at a rolling boil and the chicken is cooked through, taste to make sure you are happy with the flavour (at this point you are looking for a strong flavour of Smokey paprika, saffron (if using) and a rich chicken stock kick) – season with salt and pepper if required. 6. 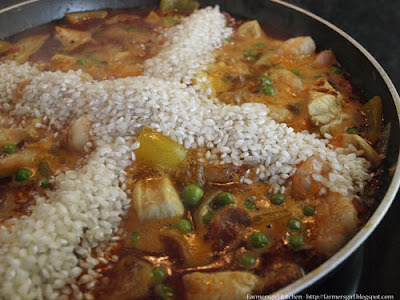 Add the Paella rice making a cross in the pan with the rice from one side to the other. 7. Share the rice around the pan carefully using a spoon to distribute the rice into the 4 sections making sure the rice is even and in every part of the pan. Cook for 10 minutes on medium to high heat. Do not stir. 8. 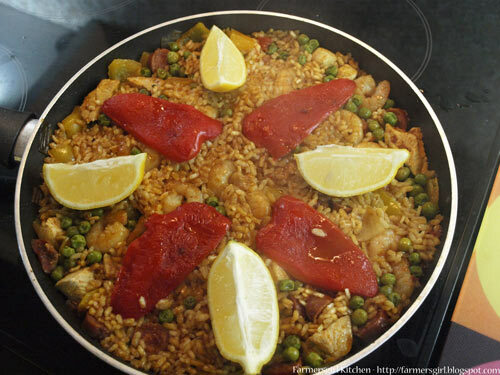 Turn the heat down to low, place the roasted red pepper quarters on top of the paella and cook for 10 minutes until the broth has been absorbed by the rice. (Have the remaining chicken stock on hand to gently ladle over the rice if required at any point within these 10 minutes). Once the broth has totally disappeared, check that the rice is al dente – cooked but with a slight bite, then turn off the heat and let it rest! A Rest is so important: 15 minutes is the La Tasca golden rule, however if you have the luxury of waiting up to 45 minutes you will see a notable difference in texture and condensed taste. If you choose the 45 minute wait, make sure you cover the pan loosely with kitchen foil. Great Paella should have a layer of rice caramelised on the bottom of the pan together with looking compact and caramelised on top; add the lemons just before serving! Only fluff up the Paella when you are about to serve! 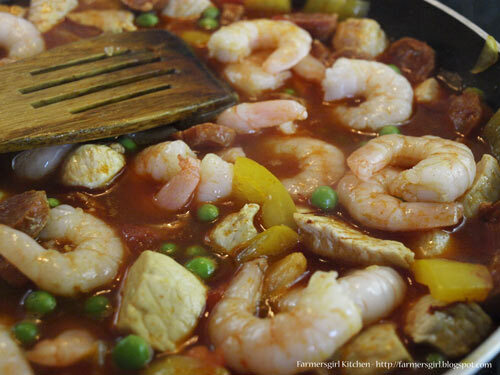 Please note: I added some prawns to the original recipe, as I am a big fan of seafood. The paella was delicious with a rich smoky flavour from the smoked paprika and chorizo, I would certainly make it again. Many thanks to Antiono for supplying the recipe and to Jade, Ella and Amy for being so accommodating. Note: I found that I had to cover the pan with foil towards the end of cooking to get the rice on the top to cook properly. This is probably because my pan wasn't big enough to get a thin layer. I love La Tasca and this looks lovely - wish I'd had this for my dinner instead! Yum yum yum! Would love to have this for dinner tonight! I haven't done a paella in ages. Wait! I think I didn't even make it once. Another thing that has to be changed as yours looks so delicious and tempting.